Now here’s something that the sporting world has been crying out for. Friday Night Bocce! 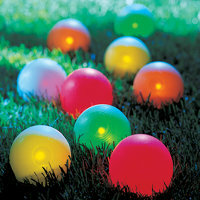 This is the illuminated bocce ball set that allows you to play in the dark. Each of the eight balls has an LED that allows you to see it in the dark from up to 100′ away. You can choose from the included sets of lighted or flashing LEDs and use them interchangeably.